Chicken breast pieces, king prawns and chorizo with cooked rice in a tomato and basil sauce. 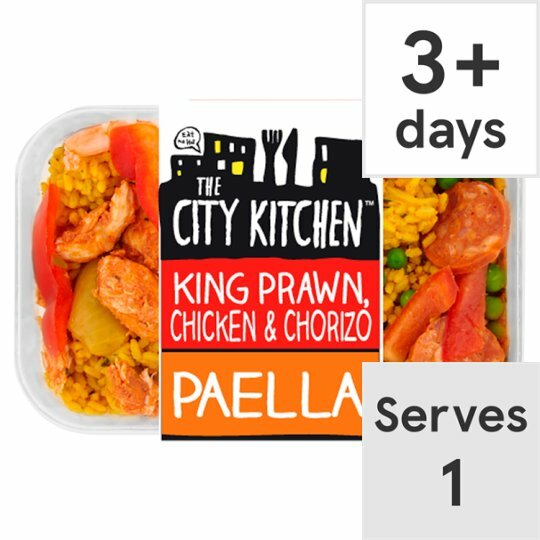 INGREDIENTS: Cooked Rice [Water, Rice, Onion, Garlic Purée, Tomato, Rapeseed Oil, Tomato Juice, Parsley, Red Chilli, Turmeric Powder, Smoked Paprika, Black Pepper, Salt], Chicken Breast (12%), King Prawn (Crustacean) (7%), Onion, Red Pepper, Tomato, Water, Peas, Chorizo (2.5%) [Pork, Pork Fat, Salt, Paprika, Dextrose, Chilli Powder, Distilled Malt Vinegar, Sage, Rosemary, Colour (Paprika Extract), Antioxidant (Sodium Ascorbate), Preservative (Sodium Nitrite)], Tomato Paste, Tomato Juice, Rapeseed Oil, Basil, Cornflour, Salt, Garlic Purée, Distilled Malt Vinegar, Sunflower Oil, Smoked Paprika, Sundried Tomato, Flavouring, White Wine Vinegar, Sugar, Chicken Extract, Black Pepper, Rosemary, Extra Virgin Olive Oil, Basil Extract, Garlic Oil. For allergens, see ingredients in bold. Also, may contain peanuts and nuts. Instructions: Remove label and slightly loosen one side of lid. Place in a microwave and heat on full power (900W) for 4 minutes. Stir before serving - careful, the tray will be hot. Before you tuck in ensure food is piping hot. For other microwave wattages, adjust times according to your manufacturers handbook. Although our chefs take every care to remove bones, some may remain.This product may occasionally contain small fragments of shell.